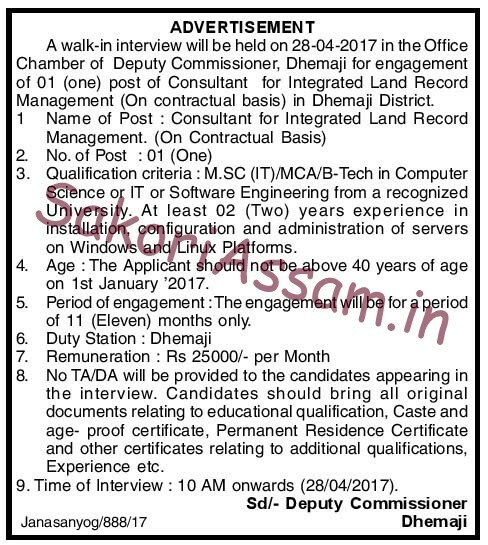 A walk-in interview will be held on 28-04-2017 in the Office Chamber of Deputy Commissioner, Dhemaji for engagement of 01 (one) post of Consultant for Integrated Land Record Management (On contractual basis) in Dhemaji District. Period of Engagement: The engagement will be for a period for 11 (eleven) months only. Remuneration: Rs. 25,000/- per month. No TA/DA will be provided to the candidates appearing in the interview. Candidates should bring all original documents relating to educational qualification, caste and age proof certificate, Permanent Residence Certificate and other certificates relating to additional qualifications, Experience etc.